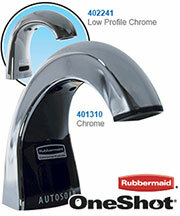 ECOS Retrofit Automatic Dual Flusher for Toilets 1.6 gpf. 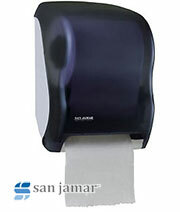 Sloan ECOS retrofits for exposed high efficiency flushometers converts manual flushometers to hands-free activation. Users who stay within the sensor range less than a minute activate the reduced flush; users who stay longer activate the full flush. It's the first Dual-Flush Flushometer of its kind, combining hands-free operation with a state-of-the-art, water-saving dual-flush feature that provides the ultimate in water savings and hygiene. 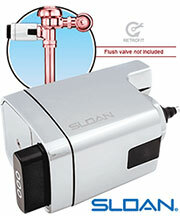 Sloan ECOS Electronic Dual Flush Flushometers incorporate intuitive Split-button design for easy manual activation. The small button controls the reduced flush cycle (1.1 gpf/4.2 Lpf), the large button controls the full flush cycle (1.6 gpf/6.0 Lpf). Straightforward graphics alert user to proper activation. Reduced flush for liquid waste, full flush for solid waste. To further educate the user, two (2) instructional wall plates are included with each Sloan ECOS Flushometer. 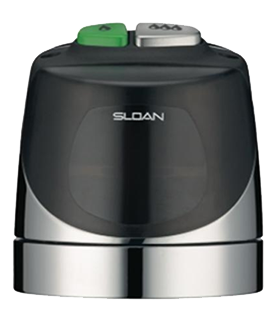 Sloan ECOS Electronic Dual Flush Flushometers can also be activated via multi-lobular infrared sensor. By detecting user presence and duration, the Sloan ECOS Smart Sense Technology will determine the proper flush volume for unequalled water efficiency. Touchless, sensor operation eliminates the need for user contact to help control the spread of infectious diseases. The Sloan ECOS Electronic Dual Flush Flushometers are provided with Reduced or Full Flush Override Buttons to allow a "courtesy flush" for individual user comfort.